One of my favorite artists today is the ever so secretive Banksey. His graffiti can be found all over the world today, but he started on the streets of London. His political jabs, thought provoking social messages, and unique style have garnered attention from the most prolific art collectors. It's been said, no art collection is complete without a Banksey. 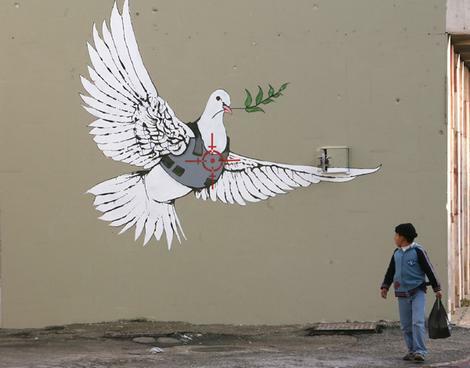 This particular 'peace dove' can be found in the center of Bethlehem. I found it thought provoking here on Christmas Eve as the symbol of peace in the world, painted in the birthplace of peace, shows the dangerous reality of our world today. As families are traveling all over the country to celebrate the birth of Jesus, exchange presents underneath the tree, and fill the hallways of homes with laughter and story telling, there are many around the world that won't be. They live under the constant pressure of war. The persecution in places like Israel, Jordan, Syria, North Korea, and Afghanistan keep people from knowing the celebrations we enjoy. I read this morning about the church in Iraq where church officials had to call off all celebrations of Christmas all together due to the constant threat of Al Qaeda. (Click to Read Here) What would Christmas be like if we didn't have the tree decorated, presents to give, or lights on the houses? What would Christmas really mean? At the central part of the Christian Faith, none of these things have much meaning to why we do what we do. In fact, most of the images of Christmas can be traced back to pagan religions and harvest festivals. But the reason why we celebrate this moment in history is the God Fusion. No matter the celebratory traditions we count on, we must not stray from the reason why. Why is this a special moment in Human History? Why does it matter there is a baby in the manger? To be elementary, let me say, IT MAKES ALL THE DIFFERENCE IN THE WORLD! This celebration is the beginning of the world being re-set. It's THE cosmic shift from hopeless to hopeful. It's the moment in time when God became flesh and dwelt among us. (John 1:14). It is the beginning of all things becoming new. The little baby in the manger, wrapped in swaddeling clothes, because there was no room in the Inn; it's the picture of humanity's only hope for the future. So when you're filing your belly with all the sweetness of Christmas, don't forget, it doesn't matter if you have a tree, presents, lights, or even a live nativity scene. The birth of the God/Man is the point of the story, and He alone is the hope for all world to know peace. Today, I hope we can join together and pray for our brothers and sisters in far off lands who can't celebrate today. The pressure they live under in war torn areas keeps the traditional Christmas from their public celebrations; but the truth of the season can remain in their hearts. We lift you up today. From halfway across the world, we join in spirit to pray for your spirits to be filled, your celebrations to be joyous, and your hope to have renewed strength. It won't be like this forever. We know the end of the story, and one day we'll all celebrate together. Yesterday we were talking about our perceptions of Christmas that we brought from our childhood (we are in our 60’s) Of course, these perceptions are mostly about what we are getting, eating, or drinking. It seems to us that today, in the US and more so around the world, that Christmas for the fervent Christian, is becoming more and more like the first Christmas. We are being ignored, abused, persecuted, and killed, just as fervent Jews were in the times of Christ. Let’s pray for strength to endure.